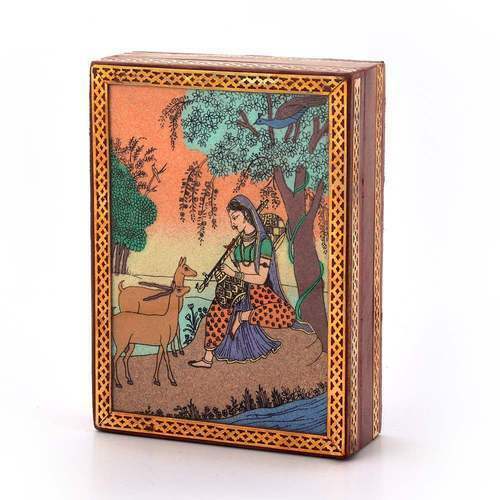 This Handcrafted Jewellery Box is made of wood and decorated with Gemstone with a flawless meera Painting. The painting is hand made with finely crushed real gemstones which is a royal and traditional art of rajasthan on a glass base. The gift piece has been prepared by the creative artisans of Jaipur. Product Usage:Keep safely your jewelery and other precious items. Use it or gift it, the masterpiece is sure to be admired by all. We Lesto Healthcare India Pvt. Ltd.are fulfilling the emerging demands of the industry by manufacturing and supplying the finest quality Paper Mache. Since our inception in the year 2012, in Jaipur, (Rajasthan, India), we have established an innovative and the latest infrastructural facility in order to design the offered products within the stipulated time frame. Our infrastructural facility is segregated into enormous departments such as procurement department, production department, quality testing department, sales & marketing department, warehousing & packaging department, transport & logistic department, etc. Our manufacturing unit is well-armed with modern machinery, equipment and tools to design in conformity with the latest market trends. In addition to this, our ethical business polices, timely delivery and customers oriented policies have enable us to attain the commendable position among our competitors. We also trade, wholesale, retail and supply quality approved Metal Ware, Wood Handicraft, Brass Handicraft, Marble Art and Fabric Handicraft.